Winter is quickly knocking on our door and the holidays are not far behind. Wouldn't it be great to get a head start on your holiday creating? Join us this month for "Holidays in Winter" and we will help you prepare for the busy holiday season. 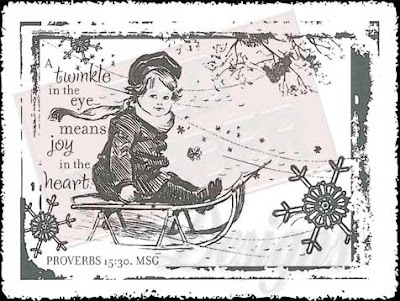 This month's Spotlight Stamp is "Twinkle in the Eye". Spotlight Stamps are always 40% off with any order. What a great deal that is! Want to see all of the featured releases for November? You can find them here. The Design Team is excited to show you what they have created with this sweet stamp. To see all of their creations you'll have to do a bit of traveling to each blog listed on the blog roll at the bottom of this post. Be sure and let them know that you visited....comments although not required are greatly appreciated. Now, here's the contest. We had so many entries for our last guessing game that we are doing it again. 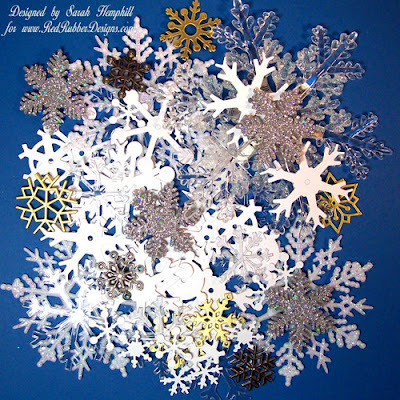 In the following picture you will see a portion of my snowflake stash. The contest is to guess how many snowflakes have drifted onto my workspace. Please send your guess (only 1 guess per player, please) to contest@RedRubberDesigns.com. One winner will be chosen from the correct answers. If there is no correct guess, the person who comes the closest will receive the Spotlight Stamp "Twinkle in the Eye". In case of a tie, a random draw will take place between those tied. Contest ends Sunday, November 4 at midnight CST. Good Luck! Such a sweeeet stamp and so much fun to play with! Yeah, more Christmas stamps! I really want "Hung on a Tree"! Lots of great new release images!! 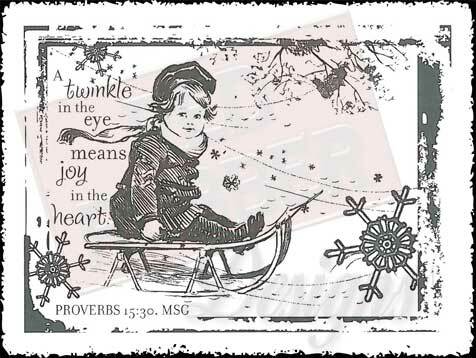 Twinkle of an eye is so sweet! I'm off to take a look at all the inspiration.